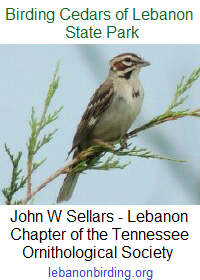 The Friends of Cedars of Lebanon State Park is an IRS Section 501 (c) (3) non-profit organization. Donors may deduct contributions to the Friends of Cedars of Lebanon State Park under IRC Section 170. The Friends of Cedars of Lebanon State Park was founded in 2014 for the purposes of protecting, improving and promoting the character and beauty, both cultural and natural, of Cedars of Lebanon State Park. We meet every other month in the park, usually on the first Saturday of the month. Unless otherwise noted, all meetings take place in Cabin 13 at Cedars of Lebanon State Park. Directions to Cabin 13: Once you enter the park through the main entrance, continue on past the park office. When you come to the split in the road, bear to the right on W.P.A. Road. You will cross 3 speed bumps then come to a gravel drive on your left (at the playground across from the Assembly Hall). If you cross the bridge you have gone too far. Turn left on to the gravel drive and #13 will be the first cabin on the right.